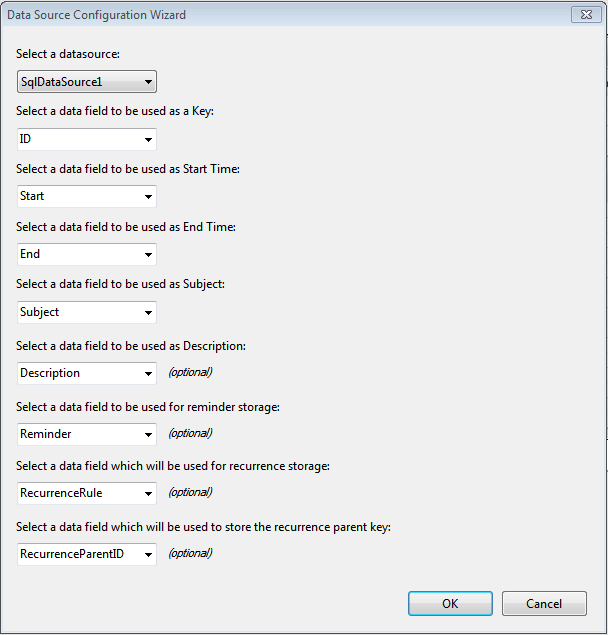 Clicking on the DataSourceID property of the scheduler does not start the scheduler'sData Source Configuration Wizard, only the standard Microsoft Data Source Configuration Wizard. If you choose to bind yourscheduler this way, you will need to enter the field bindings separately. If you have already added a DataSource component to your page, you can select the DataSource from the Select adatasource drop-down list. If you do not have a DataSource component on the page, select from the list; the wizard will guide you through the steps of defining a new datasource. For more information on how to define a new data source, see Data Source Configuration Wizard on the Microsoft Web site. There are also examples in the Getting Started tutorial and inUsing The Data Source Property. Once you have selected a data source, you must specify the fields that the RadScheduleruses to represent aspects of an appointment. The Key field is a unique identifier of the record for a specificappointment. This field is required. The Start Time field holds the starting time of the appointment.This field is required. The End Time field holds the ending time of the appointment.This field is required. The Subject field holds the subject of the appointment.This field is required. The Description field holds the description of the appointment.As this field is optional by default it is not enabled. To enable it you need to set the EnableDescriptionField="true"*. The Recurrence Storage field holds a string that encodes information about the recurrence of the appointment (its frequency, and how long the recurrence persists). This field is only needed if you want to allowrecurring appointments. If you do allow recurring appointments, you must also set the Recurrence Parent Key field. The Recurrence Parent Key field is used when the user edits a single occurrence of a recurringappointment. It holds the key field for the recurring appointment definition of which the single occurrence is a member.